We have listed some of the coolest places in Berlin to go for a swim! here is our personal top 5! Located at Berlin Grünewald, this nice and clean swimming water and the perfect green surroundings almost makes you forget that you are in the exciting metrople Berlin. To get here you just take the u2 to wittenberg platz and catch the u3 from here. All in all it will take you about an hour to get there. But it is definitely worth it! don´t hesitate and just come ask us at the reception if you should need any help with how to get there! This lake is located really close to the Tegel Airport, that is still an active airport although they will close it down somehwere in the future. this fully equipped pool with 2 big slides, beach-sports area, diving platform and a comfy sunbathing area is the perfect choice to go to with kids. they won´t be bored, and there are loads of other kids to play with. While your kids play you can relax! Together, the Wannsee Lake and the surrounding Grunewald and Düppel forests form one of the most popular recreational destinations in the southwest of Berlin. The Wannsee, which is actually a large bulge of the Havel River, offers a really wide variety of excursions and leisure trips to the Brandenburg countryside. The Berlin Stern- and Kreisschifffahrt boat tour service is located directly in front of the Wannsee S-Bahn station. There is an 4€ entrance fee! This is the most extraordinary swimming pool in Berlin and one of the coolest meeting points in town. 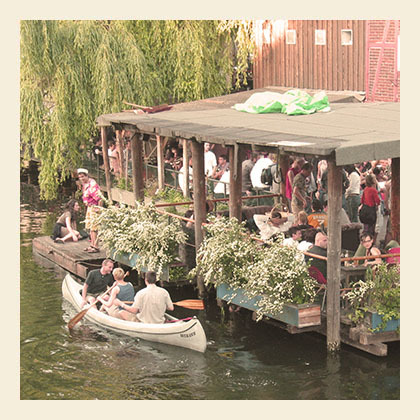 It is floating on the river spree! Further more it has a cool open air bar and a beach-like sunbathing area. Here it is all about looking and being looked at 😉 so make sure to be in shape and wear your nicest bikini/shorts! Enjoy the summer in Berlin! And stay tuned for more recommendations on what to see and do in our BLOG!